Peach trees must be correctly maintained in order for the tree to produce fruit of good quality. It is difficult to grow peach trees in any climate without some type of maintenance program. All peach trees must be properly pruned, fertilized and sprayed for maximum fruit yield. Typically these maintenance tasks are performed throughout the growing season. A constant eye must also be kept on the peach tree so the grower can stay ahead of any pest problems that may be encountered. Check with your local agricultural extension service for any special guidelines in your climate area. Prune the peach tree in mid to late February to an open bowl shape. This often resembles an upside down umbrella. Use the pruning shears and remove limbs that are touching each other or do not support the open bowl shape. Select three to four main runners on young trees for the main branches. Prune after the last hard frost, but before the new leaves begin to show themselves. 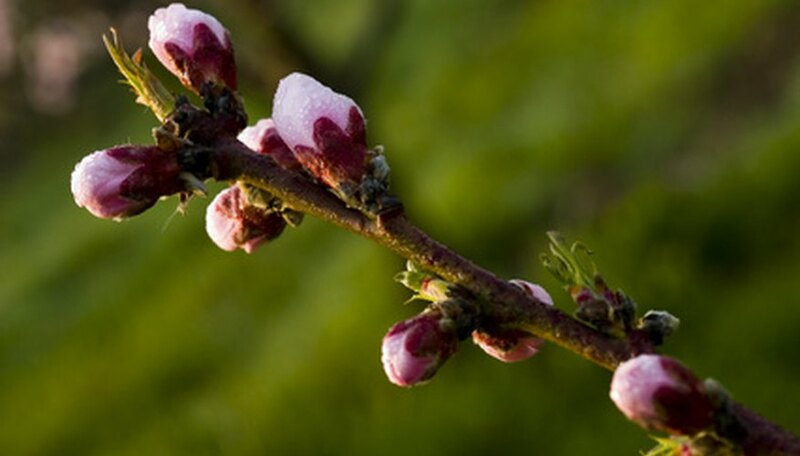 Apply fertilizer by the broadcast method under the spreading limbs of the peach tree in early March. Use one cup of 10-10-10 fertilizer for every year of growth per peach tree. Do not exceed 10 cups of fertilizer for mature trees. Thin fruits to maximize yield of the peaches. Remove the small fruits approximately four weeks after the blooms have set and the small green peaches appear. Thin the fruits to a distance of 6 inches between each fruit on every limb. This will keep limb breakage to a minimum and ensure good fruit growth. Control disease and insects by constructing a spray program with your local agricultural extension service. The service will have recommendations for the proper chemicals in your area. Various climates will have different insects and diseases. Using the proper sprays will maintain the peach tree at an economical level. Remove all fruits that have fallen to the ground during the growing season as soon as possible. The rotting fruit will encourage insects and some forms of fungus or bacteria. Keep all debris from under the peach trees. Harvest peaches when the fruit is mature. Apply a fall fertilizer to the trees after the peach harvest. Depending on climate the season will vary, but typically this may occur in late August. Broadcast one cup of calcium nitrate fertilizer per one year of growth per tree. Do not exceed four cups for a mature tree. Remove all leaf matter after the leaves have fallen from the tree, with the leaf rake. Insects can harbor under the dense ground cover and migrate to the tree during the cooler months. Consult your local agricultural extension service for a proper spraying program. Local conditions will dictate a different spraying program for various climates.